1. My timely prediction of Minnesota missing the playoffs this year suddenly looks quite prescient. 3. It's Christmas come early for roster nerds because...IT'S TRADE MACHINE TIME! Not only did a superstar in his prime request a trade, but he also gave a destination list to guide us in the right direction. Granted, his preferred teams (reportedly the Nets, Knicks, and Clippers) are not the only ones who may be willing or able to complete a trade for Butler (see George, Paul; Irving, Kyrie; and Leonard, Kawhi), but since he has indicated he would be willing to re-sign with those clubs, they should feel comfortable offering the most, so it's a good place to start. 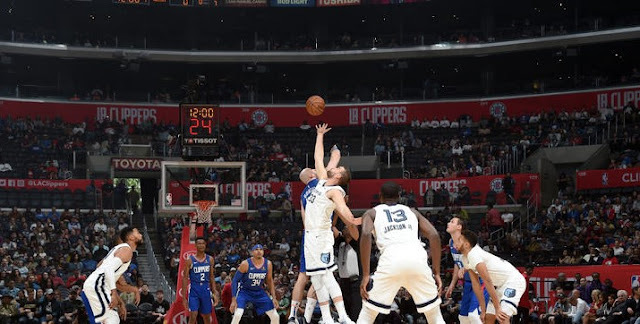 The Clips owe their 2019 first-rounder to the Celtics (via Memphis) as the convoluted result of a disastrous 2016 trade for, of all freaking people, Jeff Green (How? HOW????). The pick is top-14 protected in 2019 and 2020, then converts to a second-rounder, but because of the protections and the Stepien Rule, LA can't include a future first-rounder coming before 2022 in a trade. This could be a turn-off for Minnesota, but they might like the idea of getting back two decently valuable players with no future money committed to them. The Clippers could also substitute rookie Jerome Robinson for Beverley, which would probably be much more attractive to the Wolves. 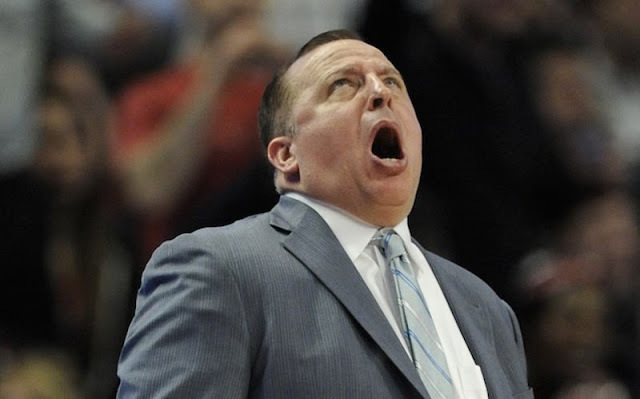 In lieu of the pick, Minnesota could also use the trade as a mulligan on Gorgui Dieng's horrific contract, exchanging him for Marcin Gortat's expiring contract, though as a team which will still be trying to preserve cap space for next offseason (IS THAT KYRIE IRVING'S MUSIC?? 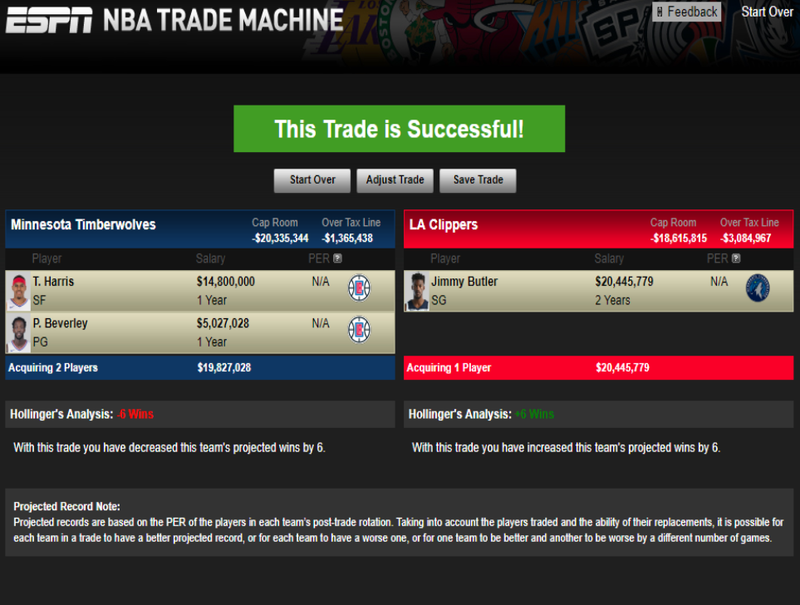 ), the Clips would probably rather give up a pick than take on more long-term money. This is going to be a theme of the trade talks. 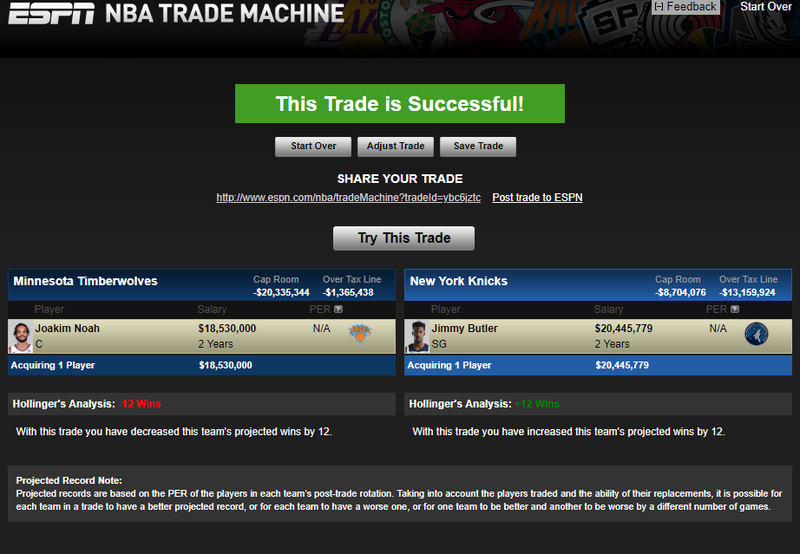 The idea of pairing Butler, Porzingis, and Knox together for the next four to five years has to be enticing for the Knicks, even if it costs them two promising young guys and a pick. There would also still be a path to signing Kyrie Irving next summer, leaving them with a core of Butler/Irving/Porzingis/Knox that would be equal parts entertaining and terrifying, assuming they ever all got on the court at once. 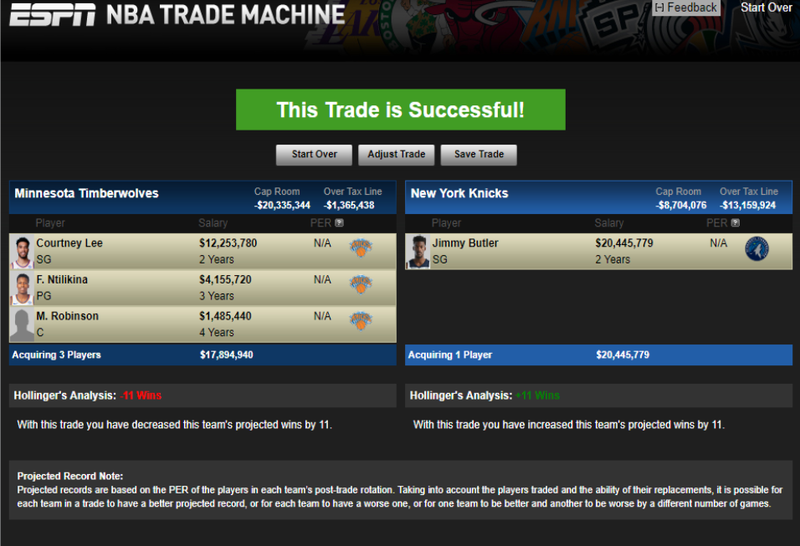 Again, I don't know if all that upside is enough to get Minnesota to pull the trigger, but it's really all the Knicks have to offer. If any of the other deals are on the table, I doubt Minnesota gives this one much thought. 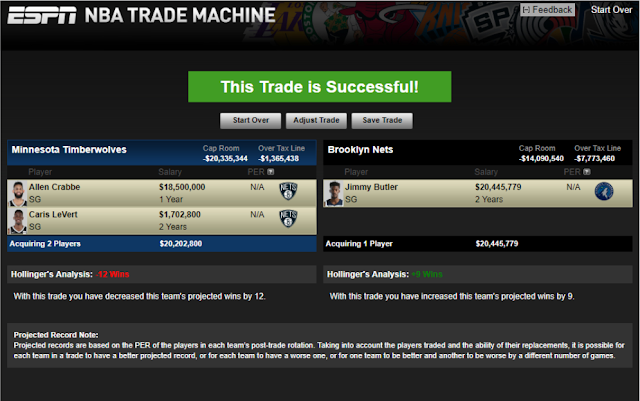 Brooklyn is just going to have a tough time drumming up the assets to make a move on a superstar at this point in their rebuild. A three-teamer is an option, but even in that scenario, they end up with a roster consisting of Butler and a bunch of spare parts. If I were part of their brain trust, the idea of shelling out multiple first rounders again after what they went through would make me sick to my stomach, so I am extremely skeptical of their involvement in these sweepstakes. Giannis and Jimmy together? Those would be some fearsome deer.